﻿ Hotel Modern Est Paris. JIMAT di Agoda.com! Hotel Modern Est terletak di Paris, berjalan kaki singkat untuk ke Gare de l'Est dan Gare du Nord. Ia menawarkan akses internet percuma. 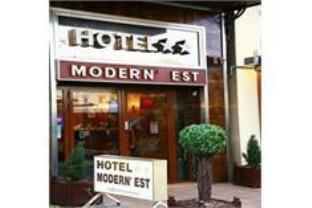 Hotel Modern Est mempunyai 20 bilik dengan bilik mandi peribadi dan TV skrin-datar dengan saluran satelit dan Canal+. Hotel ini terletak berhampiran dengan 2 stesen keretapi termasuk stesen antarabangsa Gare du Nord. Ia berada hampir dengan Lapangan Terbang Charles de Gaulle dan ke beberapa stesen metro yang menawarkan akses ke pusat bandaraya Paris. Hotel location near gare de l'est station 5 minutes by walk. The room clean. The staff so kind. Very close to the metro line which was how we went around Paris. Close to a lot of restaurants so no problem there. Rooms are clean and staff is friendly. They do luggage storage too which was great since we had to leave one luggage while we went to Rome. Breakfast is a bit pricey but was good anyways. Definitely going to recommend this hotel!